In the past few years, Sonic has been desperately pushing out 3D adventures on the next-gen consoles hoping to finally get it right. Sonic fans as well have been hoping each and every time that the next title containing their favorite blue hedgehog will pick up the speed where the predecessor failed to do so. Unfortunately, there is yet to be a single 3D Sonic the Hedgehog videogame on next-gen consoles to let the speed demon run free and embrace his true potential. Earlier today, Sega has announced Sonic Team’s newest project, Sonic Colors, as the next Sonic game for the Wii and Nintendo DS (after Sonic and the Black Knight) to be released later this year. Can Sonic finally speed back up to the high standard he set in his classic days, or will this one just be another bogged down disappointment? For those of you who heard about Sonic and the Black Knight or the previous Sonic Unleashed, then you know that these games failed at keeping the Sonic franchise fresh and alive. Sonic’s fast-paced and smooth gaming kept getting weighted down, and each game tried so hard to integrate Sonic into an action-adventure genre that he doesn’t necessarily belong to. Other next-gen titles like Sonic the Hedgehog (Xbox 360 and PS3 release) and Shadow the Hedgehog (Gamecube) were other examples of how the mechanics to a Sonic game kept veering off on tangents separate from the original gameplay. While a few of the newer ones, like Sonic Unleashed and Sonic and the Secret Rings, hint at how exciting the top-speed scenarios with Sonic could be, they never focused on or developed that element of gameplay alone. This time around, Sega is assuring gamers that Sonic the Hedgehog is revisiting the golden days of the Genesis titles. It was already announced that Sonic Team is working with Dimps to recreate Sonic’s youth by expanding on the original series with the upcoming title Sonic the Hedgehog 4: Episode 1 on PSN, Xbox Live, WiiWare, and even the iPhone/iPad. While this “arcade” game promises to contain the original fast-paced action Sonic provided, Sega still didn’t have a next-gen title willing to do the same in a brand new fashion. This is where Sonic Colors comes in. Sonic Team is finally getting some one-on-one time to help out Sonic find his roots in a next-gen console, which in this case is the Nintendo Wii and DS handheld. This time, Sonic takes a page out of Mario Galaxy and ventures into intergalactic territory chasing the diabolic Dr. Eggman only to end up in his evil amusement park. 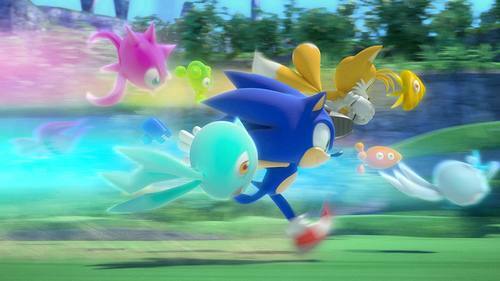 With the help of rescued alien friends called Wisps, Sonic gains new powers that help him fight Dr. Eggman. What Sega wants to promise you this time around is that Sonic will have “non-stop high-speed action” with plenty of new and engaging power-ups at your disposal. Although we have all heard this before, Sonic Team is describing this installment as combining 3D and 2D perspectives, which should create an entertaining experience reminiscent of what Sonic the Hedgehog is notoriously capable of. If done right, Sonic Colors could be the next-gen game Wii and DS owners have been waiting for that doesn’t just recreate what’s already been done before. While there is only a teaser available for now, stay tuned to Skatter Tech as we plan on getting our hands on the demo available at E3 2010! Just finished playing this now, well, didn’t finish it, just played through the first world. It has some promise but why do SEGA insist on making Sonic go 3D. The 2D parts work well but having to navigate the 3D parts with a digital dpad is insane. Another Sonic fail from SEGA. Gutted.